Chances are you will drink too much over the party season, but there is plenty you can do in advance to minimise the effects of that hangover. The key is choosing the right pre-party meal. Here, we asked some of the UK’s ­leading dietitians and nutritionists for their suggestions. 1. Baked beans (drizzled with ­Worcestershire sauce) on grainy toast with a little chopped avocado and a glass of apple juice. ‘Baked beans, avocados and grains release their energy slowly, so if you eat this two hours before going out you won’t be starving when you get there,’ says ­dietitian Azmina Govindji. ‘Adding Worcestershire sauce helps because its natural acidity slows down digestion of the beans. This means you won’t feel the effects of ­alcohol so quickly and are less inclined to have another drink quickly. ‘This meal will also help prevent the natural fall in blood sugar ­levels caused by alcohol (which leads to many hangover symptoms such as nausea and cold sweats). But you’ll still need to eat something else during the evening such as pasta. 2. Lamb chop with sweet potato wedges and peas, probiotic yogurt and a glass of water. ‘If you eat this at 2pm, it’ll still be curbing your hunger and helping to slow alcohol absorption by the time you have your first drink at 6pm,’ says dietitian Dr Sarah Schenker. 3. 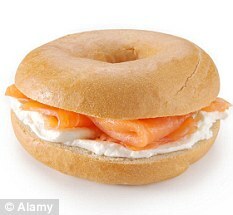 Large wholemeal bagel filled with smoked salmon, tomato and full-fat cream cheese. Followed by a banana and large glass of orange juice. ‘This is an ideal snack before a night out,’ says nutritionist Carina ­Norris. ‘It’s high in potassium, which helps balance fluid levels that can take a ­hammering during drinking — ­alcohol is a diuretic, so the body loses more fluid than it takes in. ‘Just this once, normal, low-fat rules can go out the window because the protein and especially the fat from the salmon and soft cheese help slow the rate of ­digestion, preventing blood sugar levels from dropping too slowly (a common effect of a hangover). 4. Canned rice pudding with sliced mango and a cup of tea. ‘This is a good option if you’re short of time,’ says Dr Schenker. 5. Vegetable and lentil soup and a milkshake with skimmed milk, banana and a ­teaspoon of honey. ‘Soup with lentils or pulses is stomach filling, satisfying and packed with slow-release carbohydrates — a combination that will help ensure your stomach won’t be empty (so you won’t feel drunk so quickly) and preventing your blood sugar levels dropping,’ says Sian Porter, of the British Dietetic Association. 6. Scrambled eggs on rye bread with a glass of one per cent fat milk. ‘This large afternoon snack will provide a good balance of slow release carbohydrates and protein to help keep blood sugar levels stable through the evening,’ says nutritionist Fiona Hunter.